Back in the 90s, if you’d asked me what my political persuasion was, I probably would have said I was sort of a neoliberal (in the American, Charlie Peters-ish sense of the word). My political leanings are liberal, but my temperament is technocratic and market oriented, and that made me a pretty good fit for the neoliberal team. I got steadily off that bus over the years, partly because the whole neoliberal project was based on the assumption that moderation from Democrats would prompt similar moderation from Republicans that would eventually turn down the temperature of the culture wars and produce better overall governance. Needless to say, that’s not quite what happened, something that Charlie Peters himself recognized and was unhappy about. There is a real phenomenon that you might describe as left neo-liberalism in the US — liberals who came out of the experience of the 1980s convinced that the internal interest group dynamics of the Democratic party were a problem. These people came up with some interesting arguments (but also: Mickey Kaus), but seem to me to have always lacked a good theory of politics. To be more precise — Neo-liberals tend to favor a combination of market mechanisms and technocratic solutions to solve social problems. But these kinds of solutions tend to discount politics — and in particular political collective action, which requires strong collective actors such as trade unions. This means that vaguely-leftish versions of neo-liberalism often have weak theories of politics, and in particular of the politics of collective action. I see Doug [Henwood] and others as arguing that successful political change requires large scale organized collective action, and that this in turn requires the correction of major power imbalances (e.g. between labor and capital). They’re also arguing that neo-liberal policies at best tend not to help correct these imbalances, and they seem to me to have a pretty good case. Even if left-leaning neo-liberals are right to claim that technocratic solutions and market mechanisms can work to relieve disparities etc, it’s hard for me to see how left-leaning neo-liberalism can generate any self-sustaining politics. This is a point I tried to make in different form a few months ago in “Plutocracy Now.” Political change requires big, sustained institutional pressure, and in the past that came mainly (though not exclusively) from organized labor on the left and from the business community on the right. But organized labor is now all but dead as a motivating force in American politics, and this means that the nature of America’s two main parties has been turned on its head. In the 70s, Republicans were in a certain amount of disarray, while Democrats were the party supposedly captured completely by interest group politics. Today, it’s just the opposite: Republicans have been captured almost entirely by a coherent and mutually cooperative set of interest groups who know exactly what they want, while Democrats are at war with themselves, owing allegiance both to middle class interests and corporate funders, and unable to choose between them. Barack Obama is an almost perfect example of this tension, and it’s the reason for his longstanding problems with the progressive wing of the Democratic Party. In any case, it’s pretty obvious which organizing principle has been more successful over the past couple of decades, and it hasn’t been the liberal one. 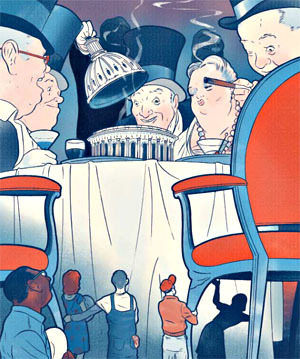 Put simply, the middle class simply doesn’t have any kind of big, persistent, institutional representation in American politics any more, and that’s left the field open for corporations and the rich to increasingly dominate economic policy. They know where their interests lie and they aren’t afraid to fight for them. Unfortunately, answers to this dilemma are thin on the ground, and Obama certainly hasn’t figured out an answer. He’s just trying to muddle through somehow. I don’t know the answer either. But as I said a few months ago, “If the left ever wants to regain the vigor that powered earlier eras of liberal reform, it needs to rebuild the infrastructure of economic populism that we’ve ignored for too long. Figuring out how to do that is the central task of the new decade.” It still is.